GoPro changed the way we share stories, but its achilles heel is the short lived battery. A GoPro has about two hours of recording time — less in cold temperatures — on a single battery. Recharging requires you take the camera out of its housing and plug it in to a wall or other charging device. But a new product now raising seed money on Kickstarter will charge your GoPro without even removing it from the housing. The Jolt system is composed of two items, a transmitter pad and Jolt battery that syncs with the pad. You replace the original GoPro battery with the Jolt battery. To charge your GoPro with its new battery, you simply place it (or the battery alone) on the pad and recharge. The transmitter can charge up to two cameras or three batteries at once. A blue LED light illuminates on the charger to show it’s charging and will change colors when the charge is complete. The device is anticipated to retail for $90 for the pad and battery. Extra batteries cost about $30 each. 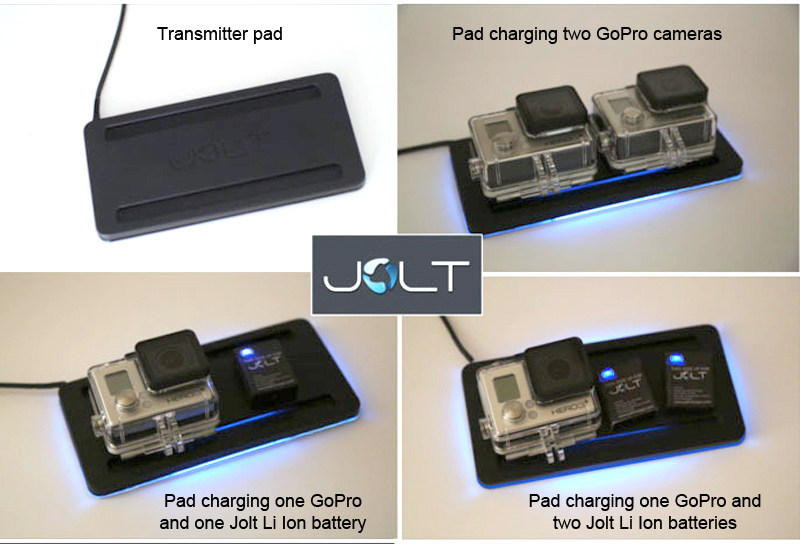 The Jolt system takes the same amount of time (70 minutes) to charge as the original GoPro battery. It can also be charged using the traditional USB connector. The Jolt transmitter still requires a power source to charge, either an outlet or 12 V AC charger. Currently, it’s GoPro specific, supporting the Hero3, Hero3+ and Hero 4. The company plans to release new batteries with new camera updates. 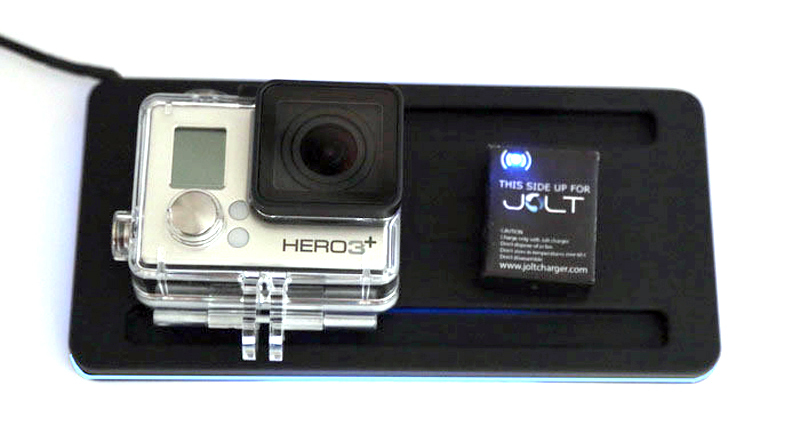 For $90, the Jolt will save regular GoPro users the inconvenience of cracking the housing open to charge the camera. While it is a lot of money for a little convenience, opening the housing does expose the GoPro to dirt, dust, moisture and other unwanted intruders, especially in outdoors situations. Those who regularly use GoPros might want to investigate this product further.